If a falling block such as gravel, falls on top of the player, the player is dropped through solid blocks until they hit an opening such as the void or a cave. If a piston pushes a block into the feet of a player, the player is phased through the blocks and could be dropped in the void. This also works with sand, gravel, and concrete powders. It didn't work with anvils, however if a piston pushes transparent blocks such as glass it would still have the same result. 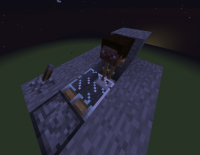 This can easily be recreated in a survival world, if a player is digging up and gravel falls on their head, they most likely will be dropped in the void, or a nearby cave if they are lucky.